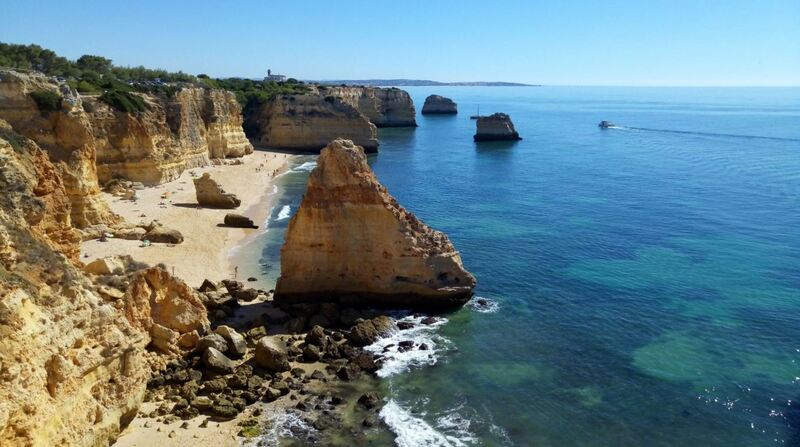 Praia da Marinha (translation: navy beach) is an iconic beach near Lagoa. It is known as one of the most beautiful beaches of the world. CNN highlights the amazing cliff side and it is the favorite beach of Lonely Planet in the Algarve. You will frequently come across photos of Praia da Marinha in advertisements for the Algarve. In real life, the beach is even prettier than on pictures. 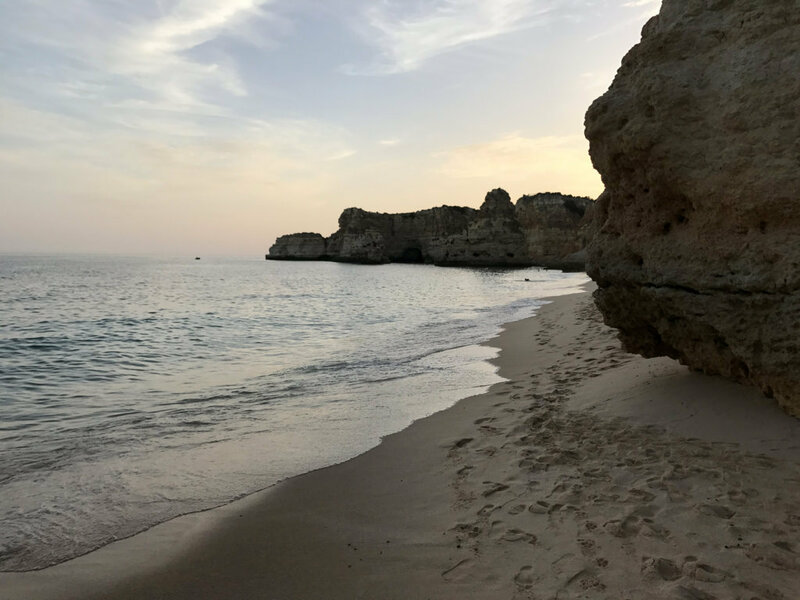 According to TripAdvisor, Praia da Marinha is one of the best beaches in Portugal, one of the top things to do in the Algarve and the #1 thing to do in Carvoeiro. 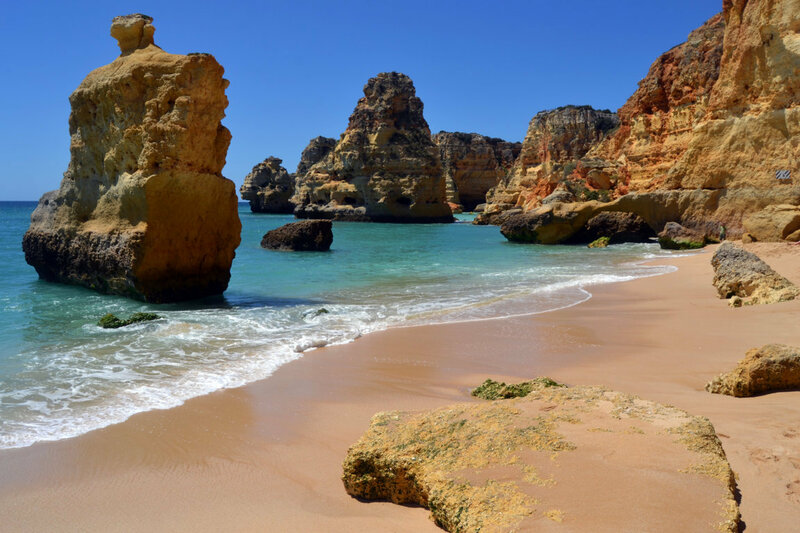 In this 5 minute video you can have a glimpse of the most iconic beach of the Algarve. When you arrive, make sure you check out the breathtaking view over the beach. The beach is surrounded by steep cliffs, which gives it a magical feeling. From these cliffs you will see a view that you will remember for a very long time. After taking in the panoramic views, you can take a long stairs (on the left) to go down to the beach. At the end of the stairs, there is a restaurant and a small part of the Marinha Beach. To get to the main part, walk around a big rock. Be warned that when tide is high, you have to walk fast in order to avoid getting wet. The same of course applies when leaving the beach. Near the beach (on the right side) you can find a famous rock structure that looks like the letter M. This is called the M rock and is one of the reasons why Praia da Marinha is unique. Especially from high up on the cliffs this is a beautiful sight. During low tide you can walk along the beach to the right to see it. Marinha is a beach where you could spend all day if you want to. The sand on Praia da Marinha is soft and the beach is well-maintained. The water is usually quite calm, but on some days the waves can get a bit higher (not too high though). Because of the surrounding cliffs, it is not that windy. Make sure to bring sunblock, because the sun can be quite strong. It is not the biggest beach of the Algarve, but usually it is easy to find a spot. Praia da Marinha is popular with Portuguese families and tourists. The beach is very suitable for children. Just bare in mind that the long stairs to get to the beach (especially the end) can be a bit difficult for small children. During peak season the beach can be a bit crowded. However, Marinha beach is not as crowded as some of the other beaches in the Algarve. This is weird considering the fact that every tourist handbook recommends this beach. Probably this is because the beach can only be reached by car. During low tide, you can walk all the way to the right. That is where you can see the M rock. During high tide it is only possible to access that part of the beach by climbing on rocks. Watch the following short video to see more of the amazing surroundings of Marinha beach. The sea near Praia da Marina is calm and the water is really clear, almost transparent. This makes it a popular destination for snorkeling, as it is possible to see many different kinds of marine species and fish underwater. So make sure to bring your snorkeling gear to this beach! Unfortunately, there are no shops nearby where you can buy snorkeling gear. Most people stay near the parking areas to enjoy the view, which – to be honest – is already great. 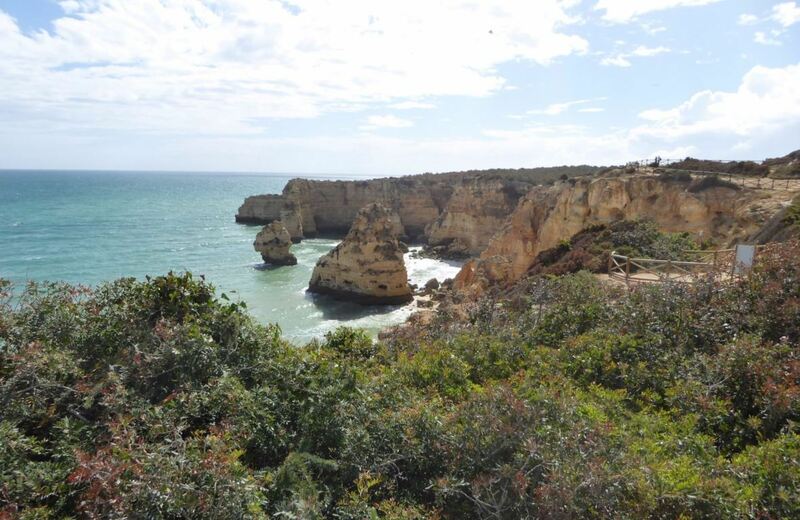 However, if you want to go one step further, there is walking trail up on the cliffs near Praia da Marinha. Instead of descending the stairs on the left to go to the beach, you go right and follow the walking trail. The walking trail lasts for several kilometers and is quite easy. This walk will give you amazing views over the nearby cliffs and beaches and can be highly recommended. The following video shows you the beauty of the walking trail near Marinha beach. Praia da Marinha is located between Armação de Pêra and Carvoeiro. The beach is very near Praia de Benagil, which is another superb beach in the area of Lagoa. In fact, you can walk from Marinha up to Benagil in around 35 minutes. Marinha beach can only be reached by car. It is too far to walk from the town of Lagoa. To get to Marinha Beach, follow the N125 and exit at the International School at Lagoa. From then on you can simply follow the signs. On top of the cliff there usually is enough parking space. If you want to be absolutely sure of a parking spot, make sure to arrive early in the morning. If you do not have access to a car, there is a bus from Lagoa. However, this bus is not very frequent (it runs twice a day on weekdays only). Another option would be to go by taxi from Lagoa. Just know that this can be a bit expensive (30-40 euros). However, if you choose this option, it would be wise to make an arrangement with the taxi driver to pick you up at a specific time for your return. Brisa do Mar. This cosy Portuguese restaurant offers nice fresh fish and seafood dishes. Located near Benagil beach. O Algar. This family restaurant is has good service and a beautiful sea view. The restaurant is reasonably priced and the quality of the food is fine. 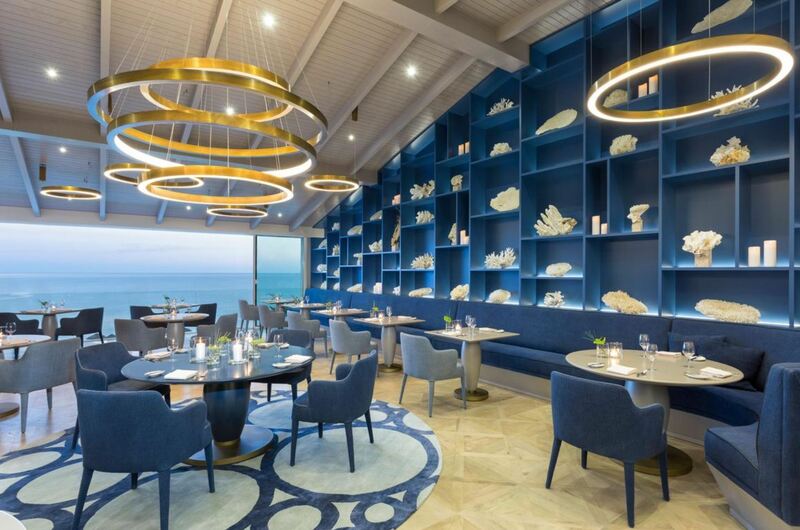 Ocean Restaurant. This restaurant has been awarded two Michelin stars. The quality of the food is exceptional. Eating here is an unforgettable experience. The Austrian chef Hans Neuner and his team prepare your dinner to perfection. More expensive than many other restaurants, but well worth it. 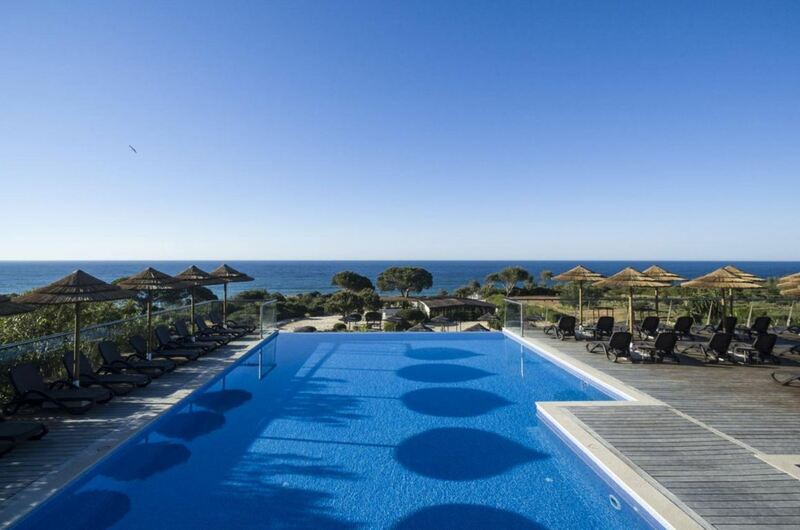 Suites Alba Resort & Spa. This 5 star hotel offers nothing but luxury. There are several swimming pools and wellness facilities, including a fitness centre, a jacuzzi and a sauna. The service is incredible. Quinta Nova Vale Del Rey. This bed and breakfast has a nice terrace outside, with a swimming pool. The place is clean, quiet and modern. Also, the host is very friendly. Quinta Das Figueirinhas & Quintinha Village. This aparthotel has rooms with a balcony overlooking the terrace. Very spacious and comfortable. You can cook your own food in the kitchen if you like. After the busy summer season of last year, we recommend to book your hotel now, as it will probably sell out. Below you can find a map with the location of hotels near Praia da Marinha. By changing the date of your holiday, the map will show you the current prices. 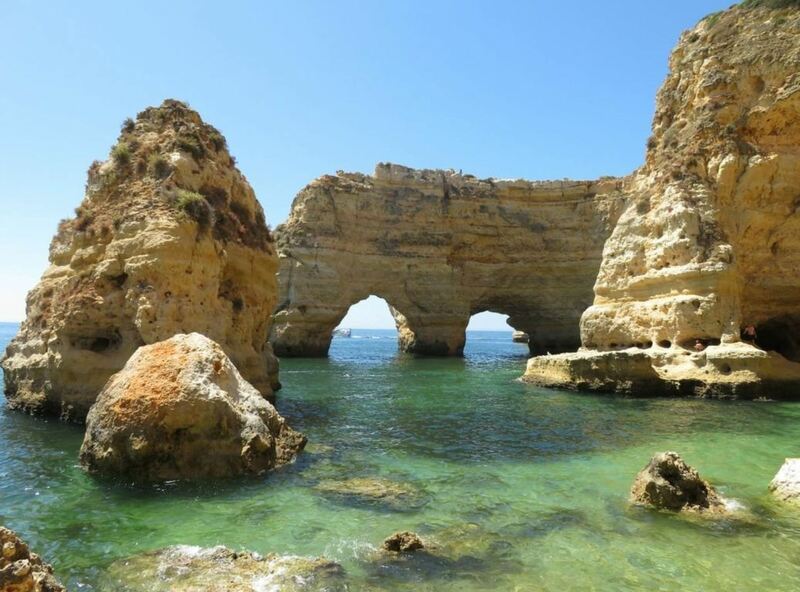 From Praia da Marinha you can take a boat trip to see the many different grottoes and caves near the coastline of Lagoa. Also it is possible to visit the Benagil cave. This boat trip is highly recommended. When visiting the beach with young children, keep in mind that it can be difficult for them to descend the long stairs to the beach. Some of the steps towards the end are quite steep. This means it is hard, if not impossible, to reach the beach by wheelchair or with a buggy. There is one restaurant on the beach, where you can get refreshing snacks and drinks. Excited much? 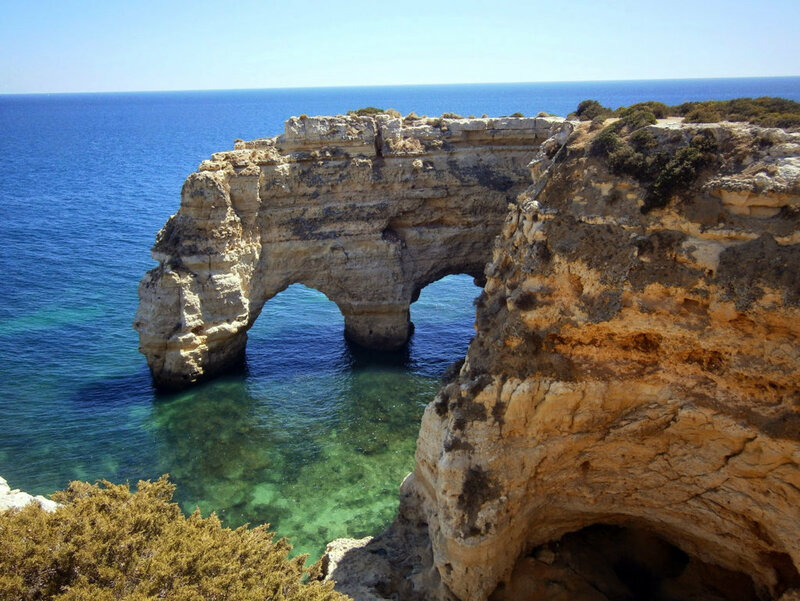 We hope you are ready for your next holiday adventure in the Algarve! 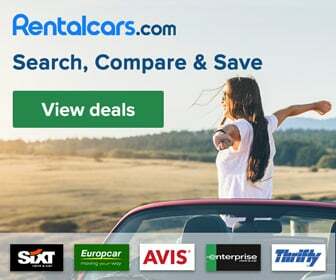 Don’t forget to check out our other pages and discover all the secret tips on more amazing destinations in the Algarve.